Try now the Accelerated Machine Learning Library on Amazon AWS. InAccel's Accelerated Machine Learning Suite (AML) is a fully integrated framework that includes both the Software APIs/libraries and the FPGA files for accelerating your machine learning applications. It aims to maintain the practical and easy to use interface of other open-source frameworks and at the same time to accelerate the training part of machine learning models. The accelerators can achieve up to 15x speedup compared to multi-threaded high performance processors. InAccel provides all the required APIs in Python, Scala and Java for the seamless integration of the accelerators in your applications. Logistic regression is used for building predictive models for many complex pattern-matching and classification problems. It is used widely in such diverse areas as bioinformatics, finance and data analytics. It is also one of the most popular machine learning techniques. It belongs to the family of classifiers known as the exponential or log-linear classifiers and is widely used to predict a binary response. Recommendation engines are widely used in order to predict the rating that a user would give to an item based on the user’s past behavior. Modern recommendation engines are based on computational intensive algorithms like collaborative filtering that needs to process huge sparse matrices in order to provide efficient results. The InAccel accelerator implements the Alternating Least Squares-based (ALS) collaborative filtering for recommendation engines that can be used to speedup significantly the processing time. 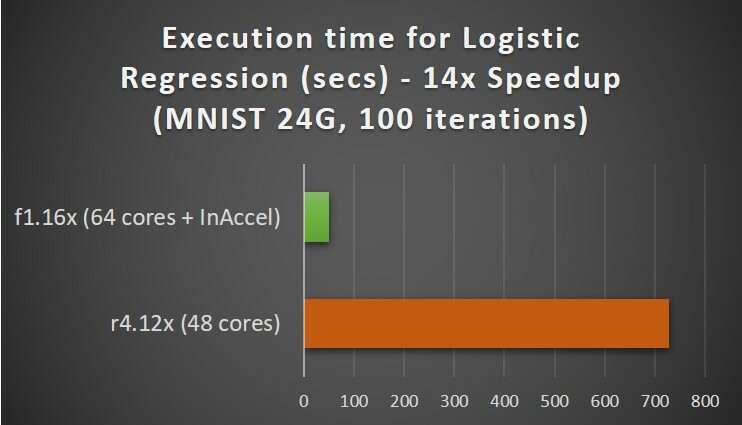 15x faster execution of logistic regression on MNIST (24GB) compared to 48-core processors with the same cost. InAccel's Accelerated ML suite can be used to speedup significantly widely-used machine learning applications like logistic regression and K-means clustering. 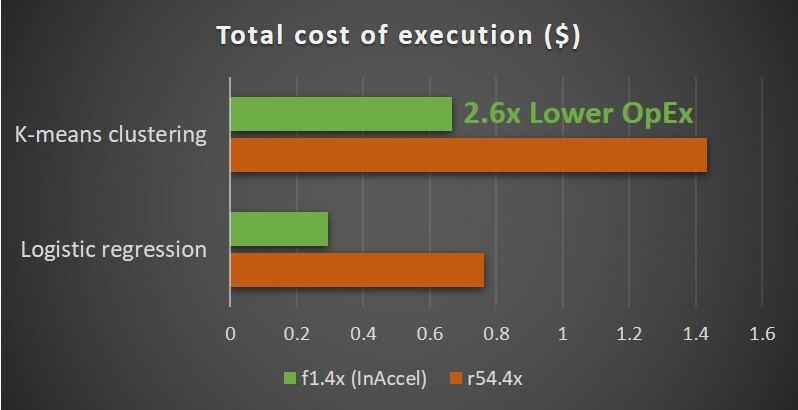 The LR core can achieve up to 7.5x speedup on an AWS f1 instance compared to a typical processor with the same number of cores. 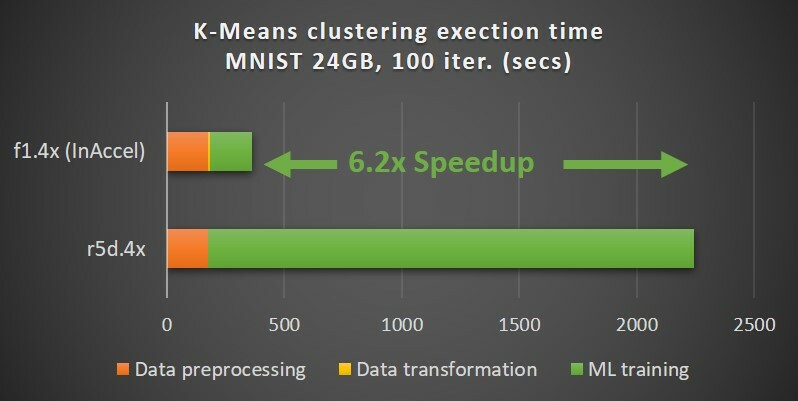 The K-means clustering core can achieve up to 6.2x speedup on an AWS f1 instance compared to a typical processor with the same number of cores. In the specific benchmark we compared a cluster of 2 f1.4x instances (in total 32 vCPUs) plus 2 FPGA against a cluster of 2 r5d.4x (32 vCPUs). We used the larger dataset of MNIST (24GB) based on 8 million images. Using InAccel Accelerated ML suite you can speedup you ML applications instantly on Jupyter notebooks. Chech the video on how you can speedup your ML applications just with a click of a button. 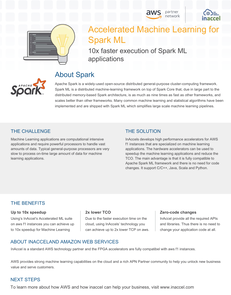 Download the Solution brief for Spark ML suite on amazon aws.